Last year at around this time, the little strawberry patch in front of our kitchen window was just starting to bloom up. I'd put it in a year previous, and it had become a riot of plants. I'd not mowed them under as some recommended, but instead let them rest under a thick blanket of insulating leaves as they overwintered. After I cleared the leaves and they got to berrying in early summer, the results were better than I'd expected. More berries than we knew what to do with, so many that I found myself making jars of delicious homemade strawberry jam. It was amazing, so amazing that I even found myself doing the church-metaphor thing. Wouldn't it be awesome if churches were as vigorous, sweet and simple as strawberry patches, I thought, and I wrote a little bit of whimsy to express that thought. But then the varmints came. Not the chipmunks, who'd been there all along, sneaking berries, slipping like furry ninjas under the fencing. Not the birds, who couldn't get in through the netting. Not the ants, who'd take a few of the berries here and there. The varmints were woodland voles. Cute little beggars, they are, but they are death for a garden. 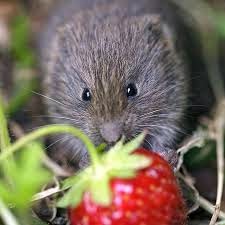 Voles don't go for the berries. They're burrowing nibblers of all green and living things, and what they go after is the life of the plant itself. They devour the whole thing, leaves and stems and all. After they're done, the plant is dead, and they move on to the next one. I noticed that some of the strawberries had been eaten down to the nub, out on the periphery of the patch. Then more. Then more still. Within two weeks, they had burned across the patch like a fire. The patch was obliterated, and they moved on to the second patch I'd put in. I found their holes, and filled them in, but they returned. I had a few traps, purchased to clear the winter-nesting mice out of our house, and I deployed them, but they caught nothing. It was too late. Our harvest was destroyed, two dozen everbearing plants reduced to stumps, like Oncelers set loose on a forest of Truffula trees. This season, about a half-dozen survivors had struggled back to life in our primary strawberry patch. To bring the patch back up to speed, I repopulated it with extra plants that I'd put in a couple of overly shaded planters in our back yard. Within a day, two had been devoured, an old vole burrow hole now freshly cleared right next to them. They were back, and I was ready. By the entrance of the hole, I lined up two small nonlethal mousetraps like two barrels of a shotgun. They were sheltered under some bricks to feel "safe" for the voles. Within a day, I'd caught one, which I took a half-mile down to a patch of woods and released. It's a woodland creature, after all. It is welcome to be there. I reset the traps. Overnight, I caught another, which had up and died in the nonlethal trap. Panic? A heart attack? Starvation, perhaps, as that tiny little body consumed itself with its own hungers? Hard to tell. I dumped the tiny carcass in the back yard, cleared the trap of the stench of tiny death, and reset it. And again, I found myself thinking metaphorically about church. This Wednesday, I go to a mandated Presbytery training, one that I've already been to twice before. I know, ugh, you think, but this one is both necessary and valuable. It's required for all Presbyterian pastors every three years, and its purpose is straightforward. It refreshes us in our commitment to maintain a healthy care for the garden of our own bodies and souls, so that we won't fall prey to the soul-devouring hungers that lead to sexual malfeasance. If we are anxious, isolated and unbalanced, inattentive to our physical and spiritual disciplines, bad things happen. We can yield to the temptation to cross boundaries, in ways that destroy our covenant commitments to loved ones and our communities. It also reminds us to be attentive, to be watchful for the signs of the selfish devourers, the ones who would come into the garden and destroy the new life we are so carefully tending.